Look! You Punters just don’t understand 'time honoured' traditions ok? There is nothing wrong, let me repeat, nothing wrong with business making donations to a political party or MP. Even our illustrious Prime Minister took time out of his busy schedule to patiently explain this “time honoured” practice. For all we know, the PM knew this innuendo was about to hit the papers and selflessly cancelled his Indonesian trip to stand staunchly alongside his Treasurer? Anyhow, our Prime Minister would never lie to us. Yes, yes the nasties come out of the woodwork with the Deficit Levy twisting. Excuse me! It is a LEVY, not a tax, did you not listen to our Prime Minister? Tony Abbott knows pure of heart when he sees it! Personally I think that Mr Sean Nicholls who wrote this nasty muckraking piece for Fairfax, which paints the lovely Mr Hockey in such an unflattering light should be ashamed of himself. I mean, if you could afford it, who would not want to rub shoulders on a regular basis with a fine figure of a man like Mr Hockey? Charisma just oozes off him. I think Mr Nicholl’s may have gotten a tad over-excited here, I mean, really, just because Mr Hockey has some people paying up to $22k to have access to himself and maybe some of his advisors/staff, doesn’t mean that Mr Hockey would deign to favour them and their aims over us the punter. Not that Mr Nicholls said that, but, I’ve seen the nasty people on twitter, that is the conclusion that they are jumping to and it is so unfair. I am sure that if a journalist bothered to actually sit down and talk to Mr Hockey he would find it highly likely that Joe Hockey has a similar program in place in for non profit groups? Did Mr Nicholl’s bother to ask? I am sure if we ask the peak advocacy groups representing the disabled, welfare advocates, aged care non profits and similar that they also have this sort of “privileged access”? Actually the above proves my point. I mean, the hardworking Mr Hockey is sweating over a Federal Budget at the moment and from all scurrilous media reports it would seem that the poorer in our society will be copping it just as hard as big business in the budget. Oh, I know we have not heard yet exactly how big business will be hurt in the budget, but, I have faith, I am sure that Mr Hockey, being the upright, morally incorruptible politician that he is would never place the interests of large national businesses over us punters? 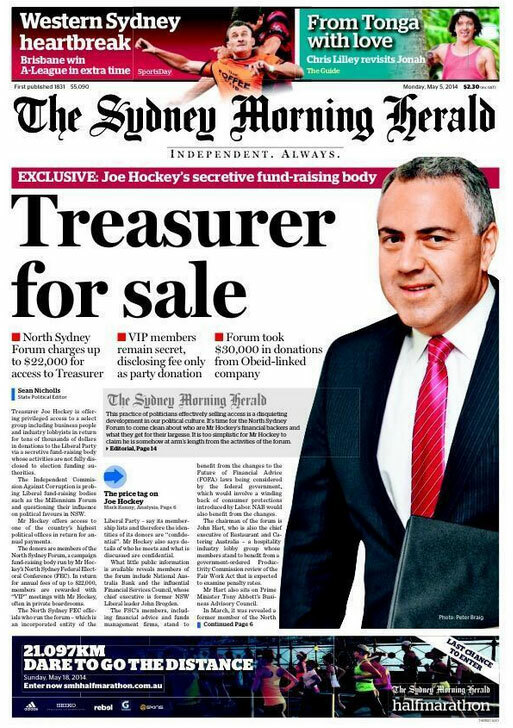 We, well the people of North Sydney, voted Mr Hockey into office, so obviously Mr Hockey is well aware of this, well aware that the voter is actually his employer, not the likes of the NAB or the Financial Services Council. The fact that the Coalition flagged getting rid of the over-bearing Financial Services reforms that the chaotic previous Government put in place is just a coincidence, stop being so suspicious people! Stop the nastiness on Facebook and Twitter and give Mr Hockey a break. These big businesses have shareholders in most cases, they are obviously fine with their profits going to politicians or political parties as donations. I am sure those very same shareholders don’t expect anything in return for those amounts of money. They would all agree that Mr Hockey is a bloody good bloke and deserves a bit of extra help getting elected to Parliament and representing the interests of such an important electorate as North Sydney with very serious issues that the poor people of North Sydney face each and every day. These struggling voters need a person of Mr Hockey’s calibre to fight for them. Some gutter types have even inferred the North Sydney Forum is a ‘slush fund’? I mean, it is not like it is a dodgy Union giving money to the ALP. There is no way in the world you can compare a Liberal fund raising entity to a Labor Union Slush Fund. They are not even similar. For starters, Unions are bad. You would have to have been living under a rock in recent years to not know that. We don’t really know where Union money comes from, well, some have suggested that it is from Union members, but, they are so sneaky those Unions, we really don’t know? We don’t know what those Union agenda’s are either. I mean, why would a Union raise and pay money to a political party? Yes I know they say it is to protect workers rights, but do we really know that is true? The fact that members of these Unions are workers could be an unrelated coincidence? Now, an incorporated entity of the Liberal Party is a totally above board fundraising initiative. It is businessmen and big businesses at these events. Name me one occasion when a big business has not had the welfare of the nation at the heart of their dealings? Yes, I do understand they need to make a profit, but you never hear about businesses being embroiled in nasty underhand dealings like Unions do you? I am sure Sky & ABC would tell us if that was the case? Too many in the media think we punters are dumb and unsophisticated and when the likes of Social Media jump to crazy conclusions like they did this morning who can blame them? Maybe it is because we have gotten caught up in too much reality television like ICAC and are now getting carried away, seeing corruption and dodgy dealing surrounding every politician? I am not sure how to explain why we can’t just see clearly in regard to political donations?